Our Levitation Knee Brace’s rigid shell provides the same lateral support as a traditional ACL knee brace. In addition however, our brace is designed to shorten your rehabilitation time and improve your leg muscle strength. Levitation can be used to help promote faster recovery and a safe return to weight-bearing activities. 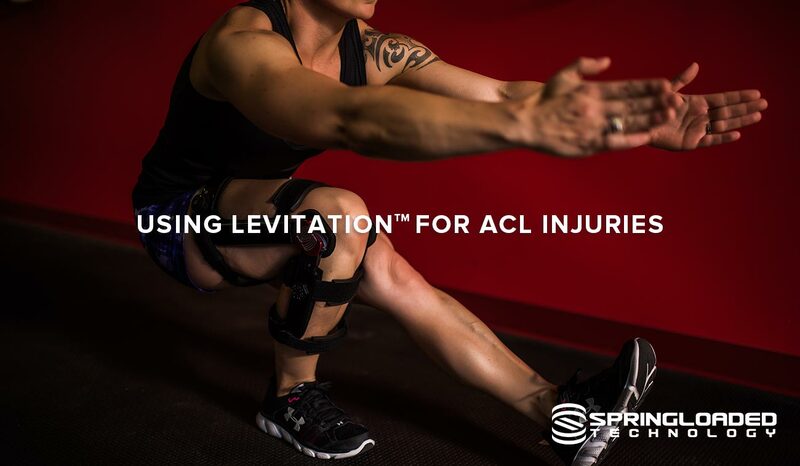 Levitation acts like a shock absorption device to dampen flexion (bending) and promote extension (straightening) of the knee. Although the ACL is most at risk when your leg is straight (or close to straight), it’s extremely important to regain complete muscle strength and stability during controlled rehabilitation exercises before return to play/activity. Proper strengthening and normal loading is essential for overall joint health and for reducing the risk of re-injury. Here is an example of how your doctor or physiotherapist might use the brace to help expedite your rehabilitation from an ACL injury or surgery. Start by restricting how much your can bend (flex) your knee with a very strong spring setting. This is important when healing post-surgically, for example, to help prevent damage to the ACL graft and graft harvest site. As you get better, reduce the level of force output provided while simultaneously increasing the unassisted range of motion, allowing and encouraging flexion (bending) during rehabilitation exercises to help teach proper technique and protect the repaired ACL. Note: in this phase of rehabilitation, the patient is returning to weight-bearing and is working to strengthen their leg muscles and overcome “quadriceps activation failure”. Quadriceps activation failure (QAF) refers to a reduction in your ability to use your thigh muscles to their full strength. QAF is extremely common in patients with an ACL injury, after surgery, and when the patient has anterior knee pain (pain in the front of the knee). Simultaneously, the patient is re-learning normal weight bearing and loading patterns for their involved knee. The brace functions to augment the natural strength of your quadriceps (thigh) while weight-bearing. This allows for “neuromuscular rehabilitation” where even partial activation of the quadriceps is rewarded with pain-free extension. As a result, the brain learns to overcome the most common cause of quadriceps activation failure, known as “arthrogenic muscle inhibition”. Arthogenic muscle inhibition refers to a reflex that causes your brain to send reduced signals to your muscles, resulting in less muscular activity, reduced leg function, and overtime, a loss of strength. The brain can then increase the signal it sends to the muscles, allowing for full activation of the muscle and the achievement of normal joint loading. In the next phase, you can continue to use the extension assistance during rehabilitation exercises to promote pain-free muscle activation, strengthening, and normal joint loading while weight bearing. You can then gradually reduce the level of assistance, then completely turn off the extension assistance during return to play/activity, leaving the you with a traditional ligament brace that provides increased joint stability, proprioceptive awareness, and reduced risk of over-extension. Note that your physiotherapist or doctor may use a different approach specific to your situation. They also have the option to specify the level of force-output and the shape of the force response curve, if desired.